Islamist insurgents in Myanmar burned down a monastery, a school and 37 more houses in Nantthataung village. MOSCOW (Sputnik) — Myanmar's Islamist insurgents in the Rohingya ethnic group's home region have broken a border fence between Myanmar and Bangladesh and burned down several buildings, including a Buddhist monastery in the region, local media reported Monday. — Thowe Htein (@thowehtein1973) 4 сентября 2017 г. 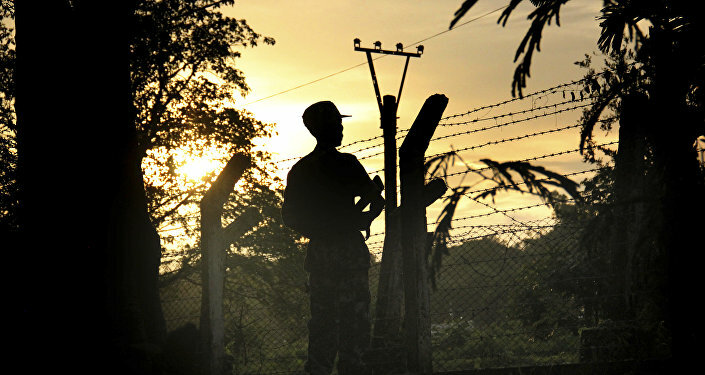 According to the Myanmar News Agency, the insurgents damaged two sections of the fence and attacked the village of Nantthataung. During the assault, insurgents burned down a monastery, a school, 37 more houses and ferociously decapitated all the Buddha statues in the village. Violent attacks carried out by Rohingya have targeted police and army outposts in Myanmar's Rakhine state. In response, the country's authorities launched an operation against the insurgents. About 400 people, including at least a dozen security officers and 370 insurgents, have been killed in the clashes, according to reports by the country's state media. Official figures said that more than 60,000 Rohingya people crossed the border between Bangladesh and Myanmar fleeing the violence in Rakhine. — Ro Nay San Lwin (@nslwin) 4 сентября 2017 г.
Rakhine is the site of frequent clashes between Myanmar's Muslims and Buddhists. The conflict that started about a century ago had gradually escalated since 2011 before hitting its peak in 2012, when thousands of Muslim families sought asylum in the special refugee camps on the country's territory or fled to Bangladesh.